Thou Shalt Suffer began in 1991 when vocalist Ihsahn met guitarist Samoth at a clinic for rock musicians. The two started playing together under various names, such as Dark Device, Xerasia, and Embryonic. They eventually settled on Thou Shalt Suffer. It was during this time Ihsahn began to develop his skills as a keyboard player, and his trademark sound can be heard on the band's recordings. 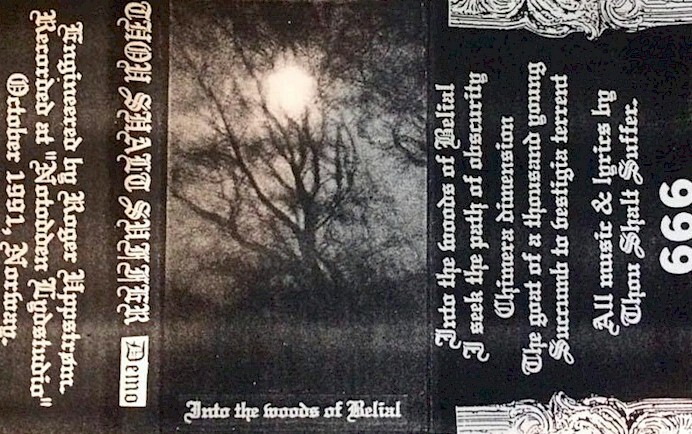 In 1991, the band recorded , Into The Woods Of Belial and Open The Mysteries Of Your Creation. Both recordings exhibited a distinct style which would eventually develop into the classic "Emperor sound" of Ihsahn's and Samoth's later careers. When Samoth began writing music outside of the band, Thou Shalt Suffer began to dissolve. Bassist Ildjarn and drummer Thorbjørn Akkerhaugen both left the band. Ildjarn formed his own eponymous project Ildjarn (which was often contributed to by both Ihsahn and Samoth), while Akkerhaugen went on to found Akkerhaugen Studios. At this point (late 1991), Emperor had come into full swing, and Thou Shalt Suffer was put on hold. Ihsahn didn't completely abandon the band, however – instead, he used the name to release dark medieval-type neoclassical ambient music. The first Thou Shalt Suffer full-length album was released in 2001, titled Somnium. It was composed and produced entirely by Ihsahn. Also, in 1997, the band's original two demos were pressed to CD and released to the public. 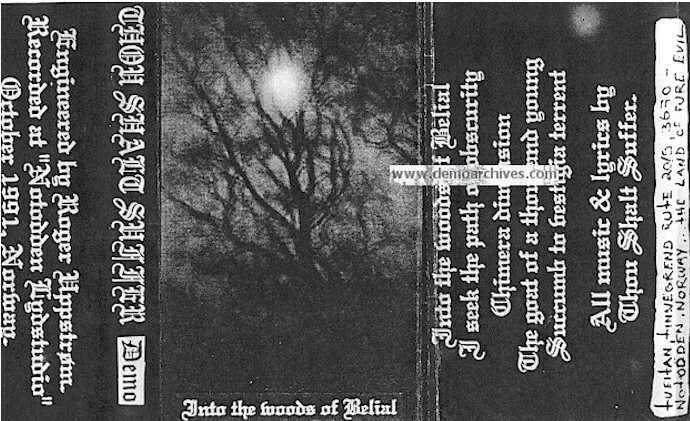 This compilation, simply titled Into The Woods Of Belial was re-released and widely distributed in 2004.